The story, untold until now, of how John Kennedy's murder affected the role of his wife, Jackie, the First Lady. Folks of a certain age will recall Jackie Kennedy's televised tour of the White House in 1962, when the gracious First Lady welcomed CBS television cameras to the people's house, a live program, broadcast to the entire nation, publicizing her efforts to re-acquire, from private collections, the original White House furniture and paintings that had been sold or discarded during previous administrations. She was heavily criticized for this endeavor by Republicans, who labeled it as an extravagant waste of the taxpayers' money, even though the entire project was privately financed. That may have been an early clue of the hatred that elements of the right wing harbored for the Kennedys. Full confirmation of that hatred would come in Dallas in November of 1963. Her story is told to a journalist, who, in this screenplay, arrives early-on at the Kennedy Compound in Hyannisport, at Jackie's request, to chronicle the events of the assassination, as well as the events which ensue in the planning for the funeral. This journalist is unnamed, but seems to be a composite of two actual historians -- both Theodore H. White (The Making of the President, 1960) and William Manchester (Death of a President). This screenplay reveals much about what we did not know of the days immediately after the assasination, as Jackie struggles to arrange the details of all that we saw during the time between JFK's death and his burial at Arlington. And all the original characters are in play -- LBJ, Lady Bird, Jack Valenti, and Bobby. And John Hurt is outstanding as the comforting Catholic priest. his last role before his death in January 2017. 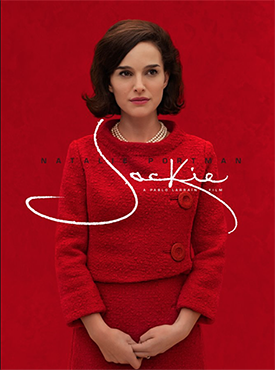 But it is Natalie Portman who carries this story single-handedly as Jacqueline Kennedy, with the same poise and vocal nuances of that elegant and stylish first lady that many of us recall so well -- so much in contrast with her immediate predecessor, the prim and proper Mamie Eisenhower, who was seldom seen and almost never heard. This is a movie well-worth seeing, both for the look back into the class and culture of our very own Camelot . .. and the resolute woman who put the broken pieces back together for herself, her children -- and the nation.